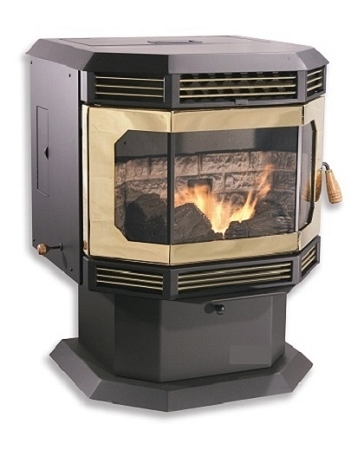 This auction is for a used DEMO model MATTE BLACK Freestanding Stove (second picture), BRECKWELL Bay Window Model 2700, 45,000 BTU/Hr., 50lb Hopper Bin, that is a Black Door and Windows with a GOLD beaded trim. Note if you want a new GOLD Door then add $200 to the price and we can create a separate Ebay buy it now transaction. Standard procedure on all add-on options is they are paid in a separate Ebay buy-it-now transaction. The Hopper Bin is 50 lbs and it has a Large Ash Drawer. If you want the Fireplace Insert as an Option, then it is an extra $100 under a separate Ebay buy it now. You can put it in any size of home, restaurant, any business, office, at 1,500 sq. ft. to 2,000 sq. ft. and even up to 2,500 sq ft subject to the configureration. It's bay-window view makes it a perfect center piece for an evening diner restaurant. If you buy it in the GOLD or NICKEL Plated Door, it is probably the most elegant beautiful bay-window wood pellet stove made. It has from 45,000 BTU/HR and will heat almost any size space you have. The 50,000 BTU/HR Option is a unit that is wider 29-1/8 inches and has a 70lb Hopper (fourth picture over). A simulated ceramic LOG SET is available as an option. It has Auto-lite, digital contol panel, and thermostat control capability either wall or remote. It is Mobile Home Approved. NOTE: For another $750 we have a Corn-burning, Multi-fuel model available in a special Ebay buy-it-now. Again to repeat: all Add-on Options will be paid by a separate Ebay buy-it-now transaction. Breckwell Hearth Products couldn't have made it any better; the best made stove in America. 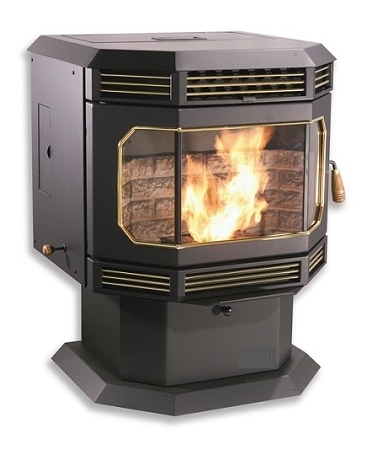 Note we sell new, used DEMO, and used stoves, inserts and call us to arrange a special buy it now. This auction is for the Freestanding Stove 45,000 BTU/Hr., 50lb Hopper Bin, that is a MATTE BLACK Door (second picture) with GOLD Beaded Trim. There are several other OPTIONS Available. Note that all Add-on Options will be paid by a separate Ebay buy-it-now transaction. In cases where the Add-on OPTION is extra, the add-on increments are paid in a separate Ebay buy-it-now transaction. This is done to avoid the circomvention of Ebay fees. All OPTIONS are repeated here: (1) GOLD Door is $200 more, (2a) NICKEL Door in new stove add $200, (2) Matte BLACK Door in new stove is same price, (3) Bigger 70 lb hopper with 50,000 BTU/HR $300 more (fourth picture over), (4) Insert is $100 more, (5) Corn-burning Multi-fuel Option $750 more, (6) Wall Thermostat $68, (7) Remote Control Thermostat $225, (8) Simulated Log Set $150, (9) Brick Wall Panel $145, (10) Flue Exhaust Kit $365, (11) Fresh Air Kit $145, (12) Power Outage Module add $179, (13) Hot-ASH Shop Vac $225, (14) Mobile Home Installation Kit $150. Again to repeat: all Add-on Options will be paid by a separate Ebay buy-it-now transaction.